Thomas Sherman Kerrigan, aka Tom Kerrigan, has been published in The Formalist, Light Quarterly, The Neovictorian/Cochlea, Iambs & Trochees, Southern Review, Slant, International Poetry Review, Poetry Monthly, Kansas Quarterly, Pacific Review, Tennessee Quarterly, and many other literary journals. He has also read his poetry on NPR. A collection of Kerrigan’s poetry, Another Bloomsday at Molly Malone’s Pub and Other Poems, was published by The Inevitable Press in 1999. 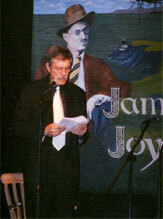 Kerrigan’s work was included in the Garrison Keillor anthology Good Poetry (Viking-Penguin, 2002). Kerrigan is also a theater critic, a member of the Los Angeles Drama Critics’ Circle, and the author of several plays, including “Branches Among the Stars” (Louisville, 1990). His plays have been produced in Los Angeles at the Ensemble Studio Theatre where he served as a member of the Board of Directors, and at the Globe Playhouse. He is also a past president of the Irish American Bar Association and once argued a case before the Supreme Court, which he won. His book The Shadow Sonnets and Other Poems is available from Scienter Press and can be ordered at www.scienterpress.org. Former American Poet Laureate Richard Wilbur described Kerrigan's poetry as "full of life, authority, playfulness, and good rhythms." X.J. Kennedy, former poetry editor of Paris Review, has hailed his work as a "rich and vivid collection admirable for the verve of its language-handling." When chaos shook the galaxy. And give an antiphon to man. Who never breathed the dust of stars. And, waking, we’ll arise, and build again. you sat between Bob Katz and me. And bragged you’d broken all the rules. Your brand new Ford was repossessed. But who’d forget that time and place? You panicked, stole a Chevrolet. A teacher from the school. You shot her twice and fled the scene. Than live without a girl or wife. Tried not to think about the past. Then shook their heads and went away. "Would back you to the very end,"
A ghost in filmy lingerie. In billets-doux, the cant of verse? And what’s become of last year’s snow? Whose faces blur across decades? Who incandesced like falling stars? But only gave me Tosca’s kiss? I trailed behind, a tongue-tied fool. I dreamt of splendor in the grass. My phoenix cast a brighter light. Believe me, that’s the Gospel truth. I loved a creature far more fair. Made simple joys egregious crimes. Evolves in cycles none can see. Their ecstasy no longer sin. She ran off with a local mensch. And made me love her from afar. That I’d been born too late, too soon. My turning, all those hours, from side to side. That silent, sad procession in my head. It all comes back, that dream of souls half dead. There’s something else--I’ve tried but can’t explain. I knew it then and never told you so. That April, morning etched our room with light. those wraiths that no one else can hear. they wait for unseen hands to leave. and talk about the chance of snow. that choir of bitter voices drones. I’ve learned to turn the volume high. O River, wind us now in light. we saw him slowly rise again. to wonder where the river leads. for hours for pinions, talons, beak. a line of reddened hills. we slowly row the skiff upstream. we pack the old sedan and leave. abreast of water, earth and sky. to know that feathered splendor once. O River, wind us now in night. to sniff a damask rose or two. in clumps beneath the oaks. last night beneath a darker sky. the squandering of all those springs. entwined with hill and heath). from shades of palest oak. this latter love is best. on business trips from time to time. and left her eyelids purple-veined. read Gide, Hugo, de Maupassant. still drying on the back yard line. my throbbing face between her girlish breasts. aware her eyes were fixed on me. My brother rose and turned the light back on. I stared at him but gave him no response. I flicked the light off two more times that night. had never really seen my face before. me cry. "What’s wrong with you?" he screamed. That fall her father got a job up north. depart with all their worldly goods inside. that night while gathered in my arms. my bedroom door awakened me. I heard enough to know Kincarrie died. exclaimed. I couldn’t sleep that night. accept my boyish lust that night ? before the cold embrace of earth? So many strangers passed this way. this green, exotic coast, unchanged. to better lead the tribes to Christ. His kind would try to hold the land. a second El Dorado rise. and civilize this untamed ground. beneath that orchard’s halfway moon. the radiance of August light? Is all, at last, just memory? we only see with children’s sight. too young to know the stain of sin. or let some barnyard share her bed. the way to get around such girls. Could riches turn that pretty head? not even Danae dare complain. on his shoulders and thigh. from the depth of his sigh. and a train of perfume. in the moment she passed. her withered husband by her side. those lovely eyes, those perfect spheres. a gorgon of diminished size. to get her back again, this crone? Was this a face to launch a skow? who dared proclaimed this imp a ten. he’d readjust her score to five. the meek who dared inherit earth. they sought the solitude of stars. for Canaans all across the land. in that neighborhood stinking of cabbage and beer. in a neighborhood stinking of cabbage and beer. and encounter those women I’d grown to adore. But a moment of truth proved my hour of despair. like some pitiful character out of Flaubert. The jargon of lovers has no word for absence. they’d never catch you staring into space again. had you twisting in your sleep last night. came flooding through the white billowing curtains. littering the morning like rose petals. no name for the barren stations of memory.